The Pokhran-II tests were a series of five nuclear bomb test explosions conducted by India at the Indian Army's Pokhran Test Range in May 1998. It was the second instance of nuclear testing conducted by India; the first test, code-named Smiling Buddha, was conducted in May 1974. Pokhran-II consisted of five detonations, the first of which was a fusion bomb while the remaining four were fission bombs. The tests were initiated on 11 May 1998, under the assigned code name Operation Shakti, with the detonation of one fusion and two fission bombs. 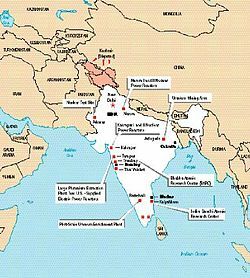 On 13 May 1998, two additional fission devices were detonated, and the Indian government led by Prime Minister Atal Bihari Vajpayee shortly convened a press conference to declare India a full-fledged nuclear state. The tests resulted in a variety of sanctions against India by a number of major states, including Japan and the United States. Many names have been assigned to these tests; originally these were collectively called Operation Shakti–98, and the five nuclear bombs were designated Shakti-I through to Shakti-V. More recently, the operation as a whole has come to be known as Pokhran II, and the 1974 explosion as Pokhran-I. Efforts towards building the nuclear bomb, infrastructure, and research on related technologies have been undertaken by India since World War II. Origins of India's nuclear program dates back to 1944 when nuclear physicist Homi Bhabha began persuading the Indian Congress towards the harnessing of nuclear energy— a year later he established the Tata Institute of Fundamental Research (TIFR). In 1950s, the preliminary studies were carried out at the BARC and plans were developed to produce plutonium and other bomb components. In 1962, India and China engaged in the disputed northern front, and was further intimidated with Chinese nuclear test in 1964. Direction towards militarisation of the nuclear program slowed down when Vikram Sarabhai became its head and little interest of Prime Minister Lal Bahadur Shastri in 1965. After Indira Gandhi became Prime Minister in 1966, the nuclear program was consolidated when physicist Raja Ramanna joined the efforts. Another nuclear test by China eventually led to India's decision toward building nuclear weapons in 1967 and conducted its first nuclear test, Smiling Buddha, in 1974. Responding to Smiling Buddha, the Nuclear Suppliers Group severely affected India's nuclear program. The world's major nuclear powers imposed technological embargo on India and Pakistan, which was technologically racing to meet with India's challenge. The nuclear program struggled for years to gain credibility and its progress was crippled by the lack of indigenous resources and dependent on imported technology and technical assistance. Prime Minister Indira Gandhi declared to the IAEA that India's nuclear program was not militarising despite authorising preliminary work on the hydrogen bomb design. As an aftermath of the state emergency in 1975 that resulted in the collapse of the Prime Minister Indira Gandhi's government, the nuclear program was left with a vacuum of political leadership and even basic management. Work on the hydrogen bomb design continued under M. Srinivasan, a mechanical engineer, but progress was slow. The nuclear program received little attention from Prime Minister Morarji Desai who was renowned for his peace advocacy. In 1978, Prime Minister Desai transferred physicist Ramanna to Indian MoD, and his government was not entirely without progress in nuclear program and had the program continue to grow at a desirable rate. Disturbing news came from Pakistan when the world discovered the Pakistan's clandestine atomic bomb program. Contrary to India's nuclear program, Pakistan's atomic bomb program was akin to United States's Manhattan Project, it was under military oversight with civilian scientists in charge of the scientific aspects of the program. The Pakistani atomic bomb program was well funded and organised by then; India realised that Pakistan was likely to succeed in its project in matter of two years. In 1980, the general elections marked the return of Indira Gandhi and the nuclear program began to gain momentum under Ramanna in 1981. Requests for additional nuclear tests continued to be denied by the government after Prime Minister Indira Gandhi saw Pakistan begin engaging in brinkmanship, though the nuclear program continued to advance. Work towards the hydrogen bomb, as well as the launch of the missile programme, began under Dr. Abdul Kalam, who was then an aerospace engineer. During the 1998 Indian general election, BJP's Atal Bihari Vajpayee promised to carry out nuclear tests. In 1989, the general elections witnessed the Janata Dal party led by V.P. Singh, forming the government. Prime Minister V.P. Singh down played the relations with the Prime Minister Benazir Bhutto whose Pakistan Peoples Party (PPP) won the general elections in 1988. Foreign relations between India and Pakistan began to severely worsen when India began charging Pakistan of supporting the militancy in Jammu and Kashmir. During this time, the missile program succeeded in the development of the Prithvi missiles. Successive governments in India decided to observe this temporary moratorium for fear of inviting international criticism. The Indian public had been supportive towards the nuclear tests which ultimately led Prime Minister Narasimha Rao deciding to conduct further tests in 1995. Plans were halted after American spy satellites picked up signs of preparations for nuclear testing at Pokhran Test Range in Rajasthan. President Bill Clinton and his administration exerted enormous pressure on Prime Minister Narasimha Rao to stop the preparations. Responding to India, Prime Minister Benazir Bhutto issued harsh and severe statements against India on Pakistan's news channels; thus putting stress on the relations between two countries. Diplomatic tension escalated between two countries when Prime Minister Benazir Bhutto raised the Kashmir issue at the United Nations in 1995. In a speech delivered by then-Speaker National Assembly Yousaf Raza Gillani, stressed the "Kashmir issue" as continue to endanger the peace and security in the region. The Indian delegation headed by Atal Bihari Vajpayee at the United Nations, reiterated that the "UN resolutions only call upon Pakistan— the occupying force to vacate the "Jammu and Kashmir Area." The BJP, came to power in 1998 general elections with an exclusive public mandate. BJP's political might had been growing steadily in strength over the past decade over several issues. In Pakistan, the similar conservative force, the PML(N), was also in power with an exclusive mandate led by Prime Minister Nawaz Sharif who defeated the leftist PPP led by Benazir Bhutto in general elections held in 1997. During the BJP campaign, Atal Bihari Vajpayee indulged in grandstanding— such as when he declared on 25 February that his government would "take back that part of Kashmir that is under Pakistan's control." Before this declaration, the BJP platform had clear intention to "exercise the option to induct nuclear weapons" and "India should become an openly nuclear power to garner the respect on the world stage that India deserved." By 18 March 1998, Vajpayee had publicly begun his lobbying for nuclear explosion and declared that "there is no compromise on national security; all options including the nuclear options will be exercised to protect security and sovereignty." Consultation began between Prime Minister Vajpayee, Dr.Abdul Kalam, R. Chidambaram and officials of the Indian DAE on nuclear options. Chidambaram briefed Prime Minister Vajpayee extensively on the nuclear program; Abdul Kalam presented the status of the missile program. 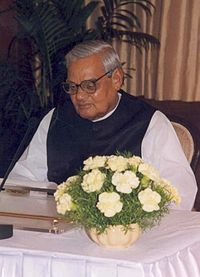 On 28 March 1998, Prime Minister Vajpayee asked the scientists to make preparations in the shortest time possible, and preparations were hastily made. It was time of tense atmosphere when Pakistan, at a Conference on Disarmament, offered a peace rhetoric agreement with India for "an equal and mutual restraint in conventional, missile and nuclear fields." Pakistan's equation was later reemphasised on 6 April and the momentum in India for nuclear tests began to build up which strengthened Vajpayee's position to order the tests. The US Marine Intelligence maps showing the Indian test site, 1997. Unlike Pakistan's weapon–testing laboratories, there was very little that India could do to hide its activity at Pokhran. 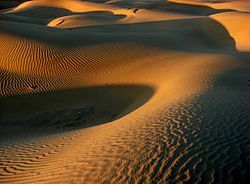 Contrary to high-altitude granite mountains in Pakistan, the bushes are sparse and the dunes in the Rajasthan Desert don't provide much cover from probing satellites. The Indian intelligence had been aware of United States spy satellites and the American CIA had been detecting Indian test preparations since 1995; therefore, the tests required complete secrecy in India and also needed to avoid detection by other countries. The 58th Engineer Regiment of Indian Army's Corps of Engineers was commissioned to prepare the test sites without being probed by the United States spy satellites. The 58th Engineer's commander Colonel Gopal Kaushik supervised the test preparations and ordered his "staff officers take all measures to ensure total secrecy." Extensive planning was done by a very small group of scientists, senior military officers and senior politicians to ensure that the test preparations would remain secret, and even senior members of the Indian government didn't know what was going on. The chief scientific adviser and the Director of Defence Research and Development Organisation (DRDO), Dr. Abdul Kalam, and Dr. R. Chidambaram, the Director of the Department of Atomic Energy (DAE), were the chief coordinators of this test planning. The scientists and engineers of the Bhabha Atomic Research Centre (BARC), the Atomic Minerals Directorate for Exploration and Research (AMDER), and the Defence Research and Development Organisation (DRDO) were involved in the nuclear weapon assembly, layout, detonation and obtaining test data. A very small group of senior scientists were involved in the detonation process, all scientists were required to wear army uniforms to preserve the secrecy of the tests. Since 1995, the 58th Engineer Regiment had learned to avoid satellite detection. Work was mostly done during night, and equipment was returned to the original place to give the impression that it was never moved. Bomb shafts were dug under camouflage netting and the dug-out sand was shaped like dunes. Cables for sensors were covered with sand and concealed using native vegetation. Scientists would not depart for Pokhran in groups of two or three. They travelled to destinations other than Pokhran under pseudonyms, and were then transported by the army. Technical staff at the test range wore military uniform, to prevent detection in satellite images. Dr. M. S. Ramakumar, Director of Nuclear Fuel and Automation Manufacturing Group; Director, Nuclear Component Manufacture. The Thar Desert in the state of Rajasthan where the nuclear site, the Pokhran Test Range, is located. Three laboratories of the DRDO were involved in designing, testing and producing components for the bombs, including the advanced detonators, the implosion and high-voltage trigger systems. These were also responsible for weaponising, systems engineering, aerodynamics, safety interlocks and flight trials. The bombs were transported in four Indian Army trucks under the command of Colonel Umang Kapur; all devices from BARC were relocated at 3 am on 1 May 1998. From the Chhatrapati Shivaji International Airport, the bombs were flown in an Indian Air Force's AN-32 commanded by Squadron Leader Mahendra Prasad Sharma plane to Jaisalmer. They were transported to Pokhran in an army convoy of four trucks, and this required three trips. The devices were delivered to the device preparation building, which was designated as 'Prayer Hall'. The test sites was organised into two government groups and were fired separately, with all devices in a group fired at the same time. The first group consisted of the thermonuclear device (Shakti I), the fission device (Shakti II), and a sub-kiloton device (Shakti III). The second group consisted of the remaining two sub-kiloton devices Shakti IV and V. It was decided that the first group would be tested on 11 May and the second group on 13 May. The thermonuclear device was placed in a shaft code named 'White House', which was over 200 metres (660 ft) deep, the fission bomb was placed in a 150 metres (490 ft) deep shaft code named 'Taj Mahal', and the first sub-kiloton device in 'Kumbhkaran'. The first three devices were placed in their respective shafts on 10 May, and the first device to be placed was the sub-kiloton device in the 'Kumbhkaran' shaft, which was sealed by the army engineers by 8:30 pm. The thermonuclear device was lowered and sealed into the 'White House' shaft by 4 am, and the fission device being placed in the 'Taj Mahal' shaft was sealed at 7:30 am, which was 90 minutes before the planned test time. The shafts were L-shaped, with a horizontal chamber for the test device. The timing of the tests depended on the local weather conditions, with the wind being the critical factor. The tests were underground, but due to a number of shaft seal failures that had occurred during tests conducted by the United States, the Soviet Union, and the United Kingdom, the sealing of the shaft could not be guaranteed to be leak-proof. By early afternoon, the winds had died down and the test sequence was initiated. Dr. K. Santhanam of the DRDO, in charge of the test site preparations, gave the two keys that activated the test countdown to Dr. M. Vasudev, the range safety officer, who was responsible for verifying that all test indicators were normal. After checking the indicators, Vasudev handed one key each to a representative of BARC and the DRDO, who unlocked the countdown system together. At 3:45 pm the three devices were detonated. Shakti I – A thermonuclear device yielding 45 kt, but designed for up to 200 kt. Shakti II – A plutonium implosion design yielding 15 kt and intended as a warhead that could be delivered by bomber or missile. 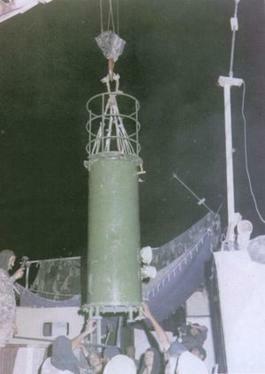 It was an improvement of the device detonated in the 1974 Smiling Buddha (Pokhran-I) test of 1974, developed using simulations on the PARAM supercomputer. Shakti III – An experimental linear implosion design that used "non-weapon grade" plutonium, but which likely omitted the material required for fusion, yielding 0.3 kt. Shakti IV- A 0.5 kt experimental device. Shakti V – A 0.2 kt Thorium/U-233 experimental device. An additional, sixth device (Shakti VI) is suspected to have been present but not detonated. At 3:43 pm IST; three nuclear bombs (specifically, the Shakti I, II and III) were detonated simultaneously, as measured by international seismic monitors. On 13 May, at 12.21 p.m.IST 6:51 UTC, two sub-kiloton devices (Shakti IV and V) were detonated. Due to their very low yield, these explosions were not detected by any seismic station. On 13 May 1998, India declared the series of tests to be over after this. News of the tests were greeted with jubilation and large-scale approval by society in India. The Bombay Stock Exchange registered significant gains. Newspapers and television channels praised the government for its bold decision; editorials were full of praise for the country's leadership and advocated the development of an operational nuclear arsenal for the country's armed forces. The Indian opposition, led by Congress Party criticised the Vajpayee administration for carrying out the series of nuclear tests. The Congress Party spokeln6i Salman Khursheed, accused the BJP of trying to use the tests for political ends rather than to enhance the country's national security. By the time India had conducted tests, the country had a total of $44bn in loans in 1998, from the IMF and the World Bank. The industrial sectors of the Indian economy, such as the chemicals industry, were likely to be hurt by sanctions. The Western consortium companies, which had invested heavily in India, especially in construction, computing and telecoms, were generally the ones who were harmed by the sanctions. In 1998, Indian government announced that it had already allowed for some economic response and was willing to take the consequences. The United States issued a strong statement condemning India and promised that sanctions would follow. The American intelligence community was embarrassed as there had been "a serious intelligence failure of the decade" in detecting the preparations for the test. In keeping with its preferred approach to foreign policy in recent decades, and in compliance with the 1994 anti-proliferation law, the United States imposed economic sanctions on India. The sanctions on India consisted of cutting off all assistance to India except humanitarian aid, banning the export of certain defence material and technologies, ending American credit and credit guarantees to India, and requiring the US to oppose lending by international financial institutions to India. From 1998–1999, the United States held series of bilateral talks with India over the issue of India becoming party of the CTBT and NPT. In addition, the United States also made an unsuccessful attempt of holding talks regarding the rollback of India's nuclear program. India took a firm stand against the CTBT and refusing to be signatory party of it despite under pressure by the US President Bill Clinton, and noted the treaty as it was not consistent with India's national security interest. Strong criticism was drawn from Canada on India's actions and its High Commissioner. Sanctions were also imposed by Japan on India and consisted of freezing all new loans and grants except for humanitarian aid to India. Some other nations also imposed sanctions on India, primarily in the form of suspension of foreign aid to India and government-to-government credit lines. However, the United Kingdom, France, and Russia refrained from condemning India. (sic).... But regrettably, India conducted nuclear tests last May, which has run against the contemporary historical trend and seriously affected peace and stability in South Asia. Pakistan also conducted nuclear tests later on. India's nuclear tests have not only led to the escalation of tensions between India and Pakistan and provocation of nuclear arms races in South Asia, but also dealt a heavy blow to international nuclear disarmament and the global nonproliferation regime. It is only natural that India's nuclear tests have met with extensive condemnation and aroused serious concern from the international community. The most vehement and strong reaction to India's nuclear explosion was from a neighbouring country, Pakistan. Great ire was raised in Pakistan, which issued a severe statement blaming India for instigating a nuclear arms race in the region. Prime Minister Nawaz Sharif vowed that his country would give a suitable reply to India. The day after the first tests, Foreign Minister Gohar Ayub Khan indicated that Pakistan was ready to conduct a nuclear test. He stated: "Pakistan is prepared to match India, we have the capability.... We in Pakistan will maintain a balance with India in all fields", he said in an interview. "We are in a headlong arms race on the subcontinent." On 13 May 1998, Pakistan bitterly condemned the tests, and Foreign Minister Gohar Ayub was quoted as saying that Indian leadership seemed to "have gone berserk [sic] and was acting in a totally unrestrained way." Prime Minister Nawaz Sharif was much more subdued, maintaining ambiguity about whether a test would be conducted in response: "We are watching the situation and we will take appropriate action with regard to our security", he said. Sharif sought to mobilise the entire Islamic world in support of Pakistan and criticised India for nuclear proliferation. Prime Minister Nawaz Sharif had been under intense pressure regarding the nuclear tests by President Bill Clinton and Opposition leader Benazir Bhutto at home. Initially surprising the world, Prime Minister Nawaz Sharif authorised a nuclear testing program and the Pakistan Atomic Energy Commission (PAEC) carried out nuclear testings under the codename Chagai-I on 28 May 1998 and Chagai-II on 30 May 1998. These six underground nuclear tests at the Chagai and Kharan test site were conducted fifteen days after India's last test. The total yield of the tests was reported to be 40 kt (see codename: Chagai-I). Pakistan's subsequent tests invited similar condemnation from the United States. American President Bill Clinton was quoted as saying "Two wrongs don't make a right", criticising Pakistan's tests as reactionary to India's Pokhran-II. The United States and Japan reacted by imposing economic sanctions on Pakistan. According to the Pakistan's science community, the Indian nuclear tests gave an opportunity to Pakistan to conduct nuclear tests after 14 years of conducting only cold tests (See: Kirana-I). Pakistan's leading nuclear physicist, Pervez Hoodbhoy, held India responsible for Pakistan's nuclear test experiments in Chagai. The reactions from abroad started immediately after the tests were advertised. On 6 June, the United Nations Security Council adopted Resolution 1172 condemning the test and that of Pakistan's. China issued a vociferous condemnation calling upon the international community to exert pressure on India to sign the NPT and eliminate its nuclear arsenal. With India joining the group of countries possessing nuclear weapons, a new strategic dimension had emerged in Asia, particularly South Asia. The Indian government has officially declared the 11 May as National Technology Day in India to commemorate the first of the five nuclear tests that were carried out on 11 May 1998. It was officially signed by then-Prime Minister Atal Bihari Vajpayee in 1998 and the day is celebrated by giving awards to various individuals and industries in the field of science and technology. Parmanu: The Story of Pokhran is a 2018 Bollywood movie based on India's underground Pokhran-II nuclear test. ^ a b c d e f g h i "India's Nuclear Weapons Program – Operation Shakti: 1998". nuclearweaponarchive.org. 30 March 2001. Retrieved 21 July 2012. ^ a b c CNN India Bureau (17 May 1998). "India releases pictures of nuclear tests". CNN India Bureau, 1998. CNN India Bureau. Retrieved 14 June 2015. ^ "Official press release by India". meadev.gov.in/. Ministry of External Affairs, 1998. Retrieved 14 June 2015. ^ a b c d e f g h i j k l m n o p q r s t u v et. al. "The nuclear politics: The 1998 Election". Nuclear weapon archives. Nuclear politics. Retrieved 16 January 2013. ^ a b BBC Release (13 May 1998). "US imposes sanctions on India". BBC America. Retrieved 17 January 2013. ^ Bates, Crispin (2007). Subalterns and Raj: South Asia Since 1600. Routledge. p. 343. ISBN 978-0-415-21484-1. ^ a b c d e f g h i j k l m n Sublette, Carey. "The Long Pause: 1974–1989". nuclearweaponarchive.org. Retrieved 14 November 2011. ^ Chengappa, Raj (2000). Weapons of peace : the secret story of India's quest to be a nuclear power. New Delhi: Harper Collins Publishers, India. pp. 219–220. ISBN 81-7223-330-2. ^ a b c d e weapon archive. "The Momentum builds". Nuclear weapon Archive. Retrieved 14 November 2011. ^ CNN (4 January 1996). "India wants to divert attention from N-test plan". Dawn Archives. Retrieved 16 January 2013. ^ "UN General Assembly – 11th Meeting official records" (PDF). documents-dds-ny.un.org. Retrieved 2018-05-24. ^ Team, ODS. "UN General Assembly – 10th Meeting official records" (PDF). documents-dds-ny.un.org. Retrieved 2018-05-24. ^ (PTI), Press Trust of India. "Pokhran II row: Sethna slams Kalam, Iyengar says tests were done in haste". DNA News. dna news. Retrieved 15 November 2011. ^ a b c d e "Books: Weapons of Peace – How the CIA was Fooled". India Today. ^ "Forces gung-ho on N-arsenal". The Times of India. Retrieved 21 July 2012. ^ BBC Report (13 May 1998). "Asia's nuclear challenge: Third World joins the nuclear club". BBC India 1998. Retrieved 17 January 2013. ^ "Prime Minister's announcement of India's three underground nuclear tests". Fas.org. Retrieved 31 January 2013. ^ a b c Lyon, David (31 May 1998). "India detonates two more bombs". BBC India, 1998 (Follow up). Retrieved 17 January 2013. ^ Cite error: The named reference BBC India, 1998 (Follow lup) was invoked but never defined (see the help page). ^ a b c d BBC Reports (1 June 1998). "India – will sanctions bite?". BBC Economic review. Retrieved 17 January 2013. ^ Weiner, T. (13 May 1998). "Nuclear anxiety: The Blunders; U.S. Blundered On Intelligence, Officials Admit". The New York Times. Retrieved 17 January 2013. ^ "U.S. imposes sanctions on India". CNN. ^ Chandrasekharan, S. "CTBT : where does India stand?". southasiaanalysis.org/. South Asia analysis. Retrieved 10 June 2015. ^ a b "Clarifying India's Nascent Nuclear Doctrine". armscontrol.org/. arms control interview. Retrieved 10 June 2015. ^ "U.S. lifts final sanctions on Pakistan". CNN. 29 October 2001. Archived from the original on 3 April 2012. ^ a b Charan D. Wadhva (27 June – 3 July 1998). "Costs of Economic Sanctions: Aftermath of Pokhran II". Economic and Political Weekly. 33 (26): 1604–1607. JSTOR 4406922. ^ a b c Resources on India and Pakistan (1999). "China's Reaction to India's Nuclear Tests". CNS Center for Nonproliferation Studies Monterey Institute of International Studies. Archived from the original on 3 January 2013. Retrieved 15 May 2012. ^ Special Report (13 May 1998). "Pakistan condemns India's nuclear tests". BBC Pakistan. Retrieved 18 January 2013. ^ a b Gertz, Bill (2013). Betrayal: How the Clinton Administration Undermined American Security. Washington DC: Regnery Publishing. ISBN 1-62157-137-8. ^ "Pakistan's tests". Retrieved 18 January 2013. ^ Hoodbhoy, PhD (Nuclear Physics), Pervez Amerali (23 January 2011). "Nuclear Bayonet". Dr. Pervez Hoodbhoy, Doctor of Philosophy (Nuclear Physics), Professor of Nuclear and High-Energy Physics at the Quaid-e-Azam University and Senior academic research scientist at the National Center for Nuclear Physics. Dr. Prof. Pervez Amerali Hoodbhoy and The Herald. ^ a b Dittmer, L., ed. (2005). South Asia's nuclear security dilemma: India, Pakistan, and China. Armonk, NY: Sharpe. ISBN 978-0-7656-1419-3. ^ a b Press Information Bureau (11 May 2008). "National technology day celebrated". Department of Science and Technology. Archived from the original on 15 December 2010. Retrieved 9 January 2011. Sumit Ganguly (Spring 1999). "India's Pathway to Pokhran II: The Prospects and Sources of New Delhi's Nuclear Weapons Program". International Security. 23 (4): 148–177. doi:10.1162/isec.23.4.148. JSTOR 2539297. Chengappa, Raj. How the CIA was Fooled written by Raj Chengappa (Weapons of peace). India Today. Retrieved 24 June 2012.